Mel’s Mini Gift Guide: All About Games! Well, it’s officially my favorite post of the year. Ok, one of my favorite posts. I LOVE sharing sincere, great, worthwhile recommendations, and today, it’s the best of all topics: games! Just as a reminder, none of my gift guides are ever sponsored. Ever! These are all games we genuinely love and have bought on our own, or they’ve been given to us by friends/family (everyone knows we love games, so we get a lot of great ones!) or we’ve played them at other people’s houses, which means, with a very few exceptions, none of these companies really know or care who I am. You are getting an unsponsored review of our faves (and trust me, I have many that didn’t make the cut because we don’t love them). I’m so excited to share with you some of our most-loved games this year! To make it a little easier this year, after each game, I’m telling you the ages in our household that like to play the game and who can play it well (i.e. without a lot of parent help). Hopefully that will help you narrow down which game(s) might be right for you or your recipient. 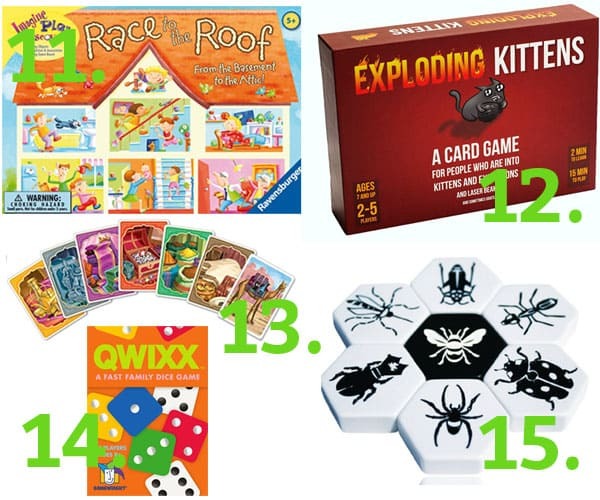 And if you are looking for even more game recommendations, here’s a game gift guide I did last year and another kid gift guide here with some great game ideas, too. Let’s get started! UPDATE: Due to some of your requests, I’ve induced my all-time top 10 games below this post if you want a concise list without sorting through multiple gift guides. 1. Enchanted forest. This is probably my favorite game of the whole lot today (thanks to one of you recommending it on last year’s gift guide!). We even lost one of the key pieces, I emailed Ravensburger, and they sent a replacement piece for free, which made me feel really warm and fuzzy. AGES: anyone ages 4+. We all love playing this as a whole family, although my 12-year old probably wouldn’t pick this out to play with his friends, he is pretty cutthroat when playing with the fam. My 4-year old sometimes needs a little help figuring out where to go, but in the interest of full disclosure, she’s also legit beat me at this one (my memory ain’t what it used to be). 2. Hover Kraft. This clever, fun game was given to us by my brother’s family last year, and it was a Christmas Day hit! We still play it all the time. It’s a unique take on a Jenga-style game with odd-shaped pieces balancing on a hover board. Super fun! AGES: anyone ages 7+ (younger can play but it’s a little harder). It’s not necessarily a family game, since it’s really best with two people, but all of our kids dig it. 3. Castle logic (Camelot Jr). Oh goodness, Cam discovered this clever, building game at our cousin’s house last year and literally wouldn’t even talk to anyone because she was so enthralled with this game (spoiler alert: she’s getting it for Christmas this year; good thing she can’t read or check blogs yet!). AGES: kids ages 4-8. This is definitely for younger kids, although I know for certain my soon-to-be 8-year old will want to “help” Cam with some of the puzzles. 4. Bohnanza. Such a fun, fun game. We were introduced at our family reunion this summer and my boys went crazy, playing every second. There are tons of add-ons but we just have the plain 1st version and there’s about a 99.9% chance my kids are trying to get a game of this in before church every.single.sunday. AGES: anyone ages 7+. It takes a few games to get the hang of the beans and their level of power, but even my 7-year old gets in on the fun (although he doesn’t grasp the same level of strategy as the older ones). This is a great option for teen/adults only, too (my brother and sister-in-law have couples over and play this very, very late into the night). 5. Doodle dice. Our friends gifted us this game last year and we love it! It’s another one we usually play as a whole family and I like that it challenges a little bit of our right brain thinking. AGES: anyone ages 4+. My disclaimer to the kids’ ages is that when Cam (4-years old) is playing, she’s usually partnered with a parent or older sibling. 6. Wits and Wagers. Thanks to my Aunt Marilyn and Uncle Dan (their names always come up when talking games; they are even more obsessive than we are) for introducing us to this game years ago. It is a guesstimate game based on whole stack of cards with questions, and it is fun (probably one of my top favorites…love games like this). AGES: anyone ages 7+. Super fun game to play with just adults, but also a great family game. Cam (4-years old) can’t play this but she likes helping move the pieces across the board. Some of the questions require a bit of explaining to the kids and then they are good to go. 7. Make ‘n’ Break. I love how uncomplicated this game is! It came extremely highly recommended by a friend, and I can attest that it is fast-paced, simple and super fun…race against the clock to build the images on the card; you can make it more complicated by having each other draw a time amount (less time for older players helps even the playing field). Love this one! AGES: anyone ages 4+. This is a great game for all ages! Obviously younger kids might not have the same advantage but you can shorten the time for older players OR play in teams. It’s definitely easy enough to learn for anyone ages 4- and up. 8. Ticket to Ride. An oldie, but a goodie! We’ve had this game for years and years, and it is still a favorite with the kids (and us adults). We have the traditional version, but that Europe variation is on our wish list! AGES: anyone ages 7+. Just like many of the other games, my 7-year old can play this game, but it is more strategic when playing with probably 12- and older (at least in our family) and is great for just adults/teens. Fun either way, just a different pace! Cam (4-year old) just makes patterns with the trains…not sure if she’s being artistic or trying to bug her brothers. 9. Labyrinth. With over 600 five-star reviews, you know a game has to be good. This is a classic and one we would highly, highly recommend. I know it seems like I have a thing for Ravensburger games (don’t even get me started on their puzzles); I guess I do! They make some of the best games – this one, with the rearranged tiles and ever-changing maze is a whole new game every time you play and brings out the inner strategist (I like to think I’m pretty decent, but my kids totally school me). AGES: anyone ages 8+. My 7-year old is still getting the hang of this one; I think it’s best for kids 8 and up, and even just for teens and adults to play with each other. 10. Blink. Simple, fun, happy card game. That’s how I’d describe this. It’s fast and easy to play and great for teaching people a game…without having to teach hardly at all! AGES: anyone ages 7+. Cam (4-year old) has a bit of a hard time with this one, but we’ve played it enough that even she is catching on. The rest of us love it – definitely good for a family game night. My younger boys (7 and 9) pull this one out more than the older, but it’s fun for all ages. 11. Race to the Roof. 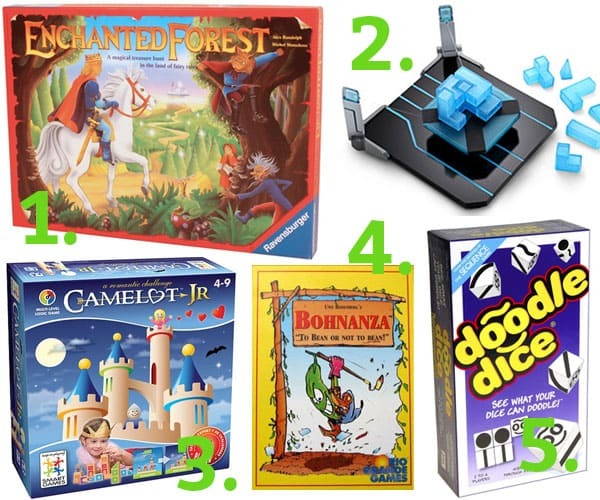 This is in Cam’s top three favorite games (the others being Enchanted Forest and Sleeping Queens). She looooves it. It’s like Chutes and Ladders with a hidden pictures vibe (love that part!) and it’s a great one for young game players. Because the large tiles are in a different position each game, it doesn’t get old playing it over and over and over and over (ahem, I’ve been known to hide this one so Cam chooses a different game when it’s her turn – I feel lighter now that I’ve confessed that). AGES: kids (4-?). A good gauge for this game is anyone who still enjoys games like Chutes and Ladders and Candy Land, will love this one (and I like it waaaay better than those two classics). 12. Exploding Kittens. Hahahaha. Exploding Kittens. This one makes me laugh, unless I’m playing with my kids, and then I have to get very, very serious so they know I’m in it to win it. With over 5,000 reviews, this is one to check out for sure. AGES: anyone ages 7+. One of those great games that can be played by a group of kids, a get together of teens, or even for an adult game night. And it’s great for the whole family, too. Again, like I’ve repeated myself a hundred times, Cam (age 4 in case you’ve missed that memo) doesn’t care for this one, but she’ll grow into it (her brothers will make sure of that). 13. Jaipur. I bought this two-player game for my parents to play together (you know, empty nesters who need stuff to do and all) and they love it! It’s a tactical card game that moves really fast, which is nice when you want a quick game and not necessarily an all-day game of Risk. AGES: anyone ages 12+ (I’m guessing you could stretch that to 10+ if that child picks up on strategy games fast). This is a two-player only game. 14. Quixx. My mom gave us this game in the summer, and it’s one of my faves to pull out for a quick game with the kids before bed. It doesn’t take overly long to play and is super easy to teach (I get a nervous twitch if games take longer than 3 1/2 minutes to explain). It’s a simple dice game, kind of similar to Yahtzee, but actually not really at all. Just play it. It’s super fun. AGES: anyone ages 7+. The box says 8+ but my 7-year old plays just fine. It’s a great family game (2-5 players, so sometimes we team up in partnerships) and would be great for kids or just for teens/adults. 15. Hive. The best way to describe this game is: it’s like chess but with bugs. It does have a bit of a learning curve trying to remember which bug can move how and where, but if you are into strategic games like chess, this one is a winner. I played it at my parent’s house and looooooved it. It’s an investment of time, but a great one. Even though my brain hurt after I played it, I immediately added it to my wish list. Great, great game. AGES: anyone ages 8+ (with the disclaimer that younger players will need a bit more time to get the hang of how each bug acts/moves). Another great game for just teens/adults. It’s a two-player game, but it’s really fun to play this tournament-style. 16. Sushi Go. I giggle every time I see this game on the shelf. You really do have to love and enjoy sushi to appreciate this game, but if you do, it’s so fun. You pass the cards around in a circle, just like a good ol’ sushi belt, and it’s fairly easy to pick up on and figure out how to get ahead. Simple and clever and fun! AGES: anyone ages 8+. Some of my boys like this game more than others; I’d say it’s most fun when we play it with 11-year old on up (would be great for just adults or tweens/teens). 17. Build or Boom. Clearly, we have a thing for building games. A mutual friend gave us this game, and literally, my boys and their friends/cousins have been playing it nonstop. It’s kind of loud (think crashing, plastic blocks) but I have never heard such fun, lighthearted hilarity. They love it, and I have to admit, I’ve kind of pushed a kid or two aside to get a chance, too. You basically try to build the construction module outlined on the card before the other person – if not, you get to “blow up” his/her project using the clever little dynamite thingie (official term). Super fun game for younger kids. AGES: anyone ages 4+ – understanding that older kids will obviously be able to build faster than younger kids. 18. Scheming and Skulking. Ooooh, this is a goodie. Easy to learn and fun for the whole family…we’ve played a variation of this with Rook cards for a lot of years, but the official Grandpa Beck’s version has some added strategy, and this is a huge family favorite (we play it a lot on Sunday evenings before bed). AGES: anyone ages 8+. Would be good for just adults and teens, too, but is also great played as a whole family with a range of ages (Cam is the official ref to make sure no one cheats, since she’s too young to play). 19. Reverse Charades. For an active, get up and move game, this one can’t be beat. My Aunt Marilyn and Uncle Dan have this game, and it’s the first choice of my kids when we are at their house (we also played it at a family reunion last year with my parents, siblings and families, and the hilarity was completely unreal). It’s exactly like it sounds – charades, just reversed – so a team of players acts out the cards to just one person on their team. AGES: anyone 4+ (as long as you can whisper the clues for non-readers). Great party or family reunion game and fun for all ages. 20. Loot. Considering we were up just last night waaaaay past bedtime playing this as a family, it’s a great one to end on. This simple card game is easy to learn and really, really fun to play. There’s a little strategy…and you’ll find yourself fighting over merchant ships and looking for pirates. One of my favorites (I know I say that a lot…but tis true). AGES: anyone 7+. Great family game that everyone in our house, sans the 4-year old, poor girl, picked up on quickly. And that’s a wrap! Thanks for sticking with me today…20 games, and would you believe, I still have probably 5-10 that I decided not to cram in today. Gotta leave some for next year! Also, I have a few more gift guides in the works – a small, simple one will be posted tomorrow with my top kid gift picks this year. See you then! Mel, we love love love all your game recommendations. 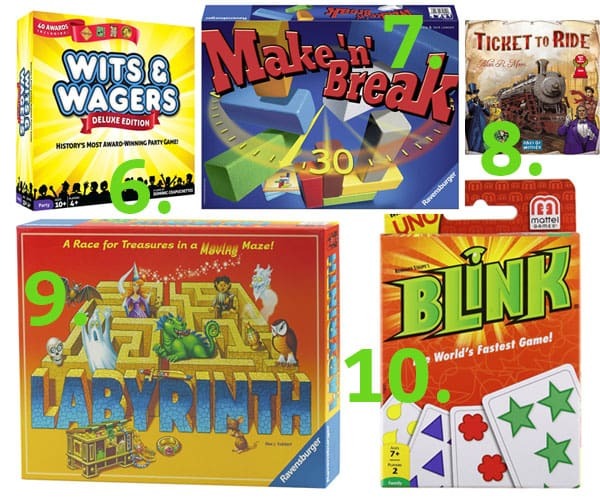 We’ve tried many of your suggestions within our family of 6, and every single one of them has been a big hit (side note, how do *you* find time to play games??). A recent massive hit was the special order hand-crafted spinning tops game! My question is, where and how do you store all your games? We are overrun with games and our cabinet is overflowing and the shelves are hard to reach for the kiddos. As a result, we have games galore messily scattered all over the nearby countertops. We have a hallway closet that we use for all our games. But it still gets messy from time to time so it’s a regular morning job around here for someone to organize the game closet. It’s a pretty big closet but we have a TON of games, so my rule is that if games start spilling out or can’t fit, we have to get rid of some. Not a perfect system, but it works ok.
We bought Enchanted Forest and Qwixx for Christmas. My kids love them both. As a math teacher, I love all of the adding and logical thinking involved in both games. My 5 year old usually beats us at Qwixx! So happy you are loving those games! 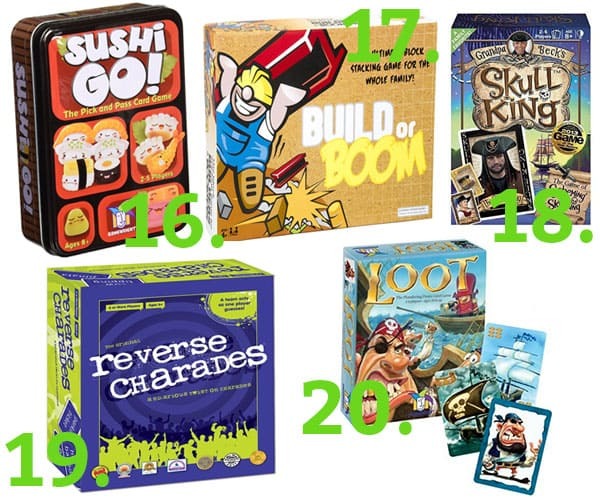 Mel, We ordered 8 games off this list for Christmas and are making our way through. All great so far. One question – the Make n Break game did not come with English directions. We looked online, including YouTube, and mostly understand it. However we cannot find the exact version. We really just don’t understand one part – how do use the cards that say 10, -> 4, etc…? Thanks! Yes, that’s it. There are 3 types of cards. All grey. Colored pieces. And just numbers, some with arrows. I could tell by the foreign instructions they were addressing those cards. I say just pitch them. Lol. This was one we gifted to my nephews. Hi Mel, now that we’re on the other side of Christmas, I have to give you a huge thank you for this list! Thanks to you, I bought Enchanted Forest, Build and Boom, and Make and Break for our family (kids are 7, 9, and 12) and we’ve loved all of them so far! The younger boys especially love Build and Boom and we all played Enchanted Forest last night and loved it. You truly are the best! I had a Favorite Things party and told all my friends about your blog because it’s truly one of my favorite things. Thank you, Emily! I love hearing back from readers that they actually enjoyed the recommendations! Happy New Year! Would you recommend Ratuki or Wackee Six for a five-year-old who picks up games pretty quickly? He LOVES Skip-Bo and I would like to get him something similar. Thank you so much! Your lists are so helpful! Thank you, Mel! Just bought Make N Break for my eight year old nephew. I think it’s perfect for a kid who love legos and likes to build things. Kids had an impromptu game of charades at dinner the other night which now prompted me to get reverse charades thanks to you!! And now I should probably clean out the game closet. How about we all post pictures of what are game closets look like??? For a family with older teens and young adults, would you recommend Loot or Skull King? Both sound fun, but we don’t want two pirate-themed games. I’d probably recommend Skull King over Loot for that age range. I picked up a copy of Skull King and played it tonight with my favorite boys – a 9 year old, twin 13-year olds, and a 16-year old. It was the first “trumping” style game the 9 year old had played, and though he had an adult helper, he was done after 7 rounds. The other 3 loved it though (as did I) and asked me to bring it back when we convene for Thanksgiving. I have played Loot (it’s been awhile), and I prefer Skull King. Another game you might check out (if you like card games) is Diamonds. Amazon calls it a board game, but its really a card game. One of our favorite family games (9, 7 & 3) is King of Tokyo. I would say it’s a good game for 6-7 and up. I love your list and just added about 6 new games to my own Christmas wish list! Thank you!! Just be sure if you do get Exploding Kittens you don’t accidentally get the explicit one! It is not a fun mistake! These are great ideas! I have a four-year-old who loves games, so I’m looking to add to our collection. You mentioned Sleeping Queens for younger kids, but Amazon recommends it for ages 8+. Can a 4-year-old enjoy this one? Thanks so much for these recommendations—I bought a couple from your list last year and we have enjoyed them so much. We have a growing collections of games, and I would love to see how you store/organize yours. Thanks! Because of your yearly game posts, I am now the go-to gal for game ideas. Ha! We always take our favs and gift them for bday parties all year. Thanks for doing all the hard work! If you’re looking for a fun card game (LDS themed), then try “It Came To Pass”. It’s similar to Uno with some fun LDS twists. Thank you so much for doing these Mel!! Your blog is a go to for recipes but these lists are equally awesome! Sleeping Queens is our favorite family game thanks to a previous list. I really trust your recommendations. Mel! This is my very post I look forward to your game gift ideas yearly!! We are a huge game family so these are great I’m so excited to add some to our list! I have to leave ya with our favorite of the year we can’t get over it and play it sooo much lately! It’s called Dragonwood It’s the best!! Thanks again for these awesome ideas!! Love your gift guides, Mel! We are a gaming family, too; thanks for the tips. “No Thanks” is our current favorite to play with the family. I’m late to the party, but thanks for bringing to light a selection of really good games. I’m a gamer, and I’m always saddened when people think board games are “just for kids.” There are so many great games today! A story: I bought Blockus for my oldest (six and a half at the time), and the first game we played was so he could learn how to play. The second game he almost beat me. Legitimately! Like “Oh crud, he’s got the hand of this!” We tied. I couldn’t have been happier. Haha, story of my life playing games with my kids! I can never win! Monopoly Deal – great card game we love! Pit – an oldie but goodie! So many more but I’ll stop now – happy game shopping! Thanks, Laura! We have a few of those, but there are some new ones to check out! Did you say that you have a gift list for kids that you are going to post? I love your gift lists! They are the best! Thanks. Yes! Sorry, I didn’t get it posted on Saturday like I thought it would but it will be up this week! I can’t get them all, yikes, my christmas budget!! Though I love ticket to ride after playing it too many times you realize that getting the long routes pretty much makes you the winner (US version, not quite in the Europe Version). (Maybe I really have played it TOO MUCH!) We were introduced to Trans America, which has similar themes to Ticket to Ride, but we just like it so much better! Not sure if you need another train game in your closet, but for those who don’t have one yet, they should compare and contrast and see if Trans America would be a better choice for them. Thank you for the recomendations. We don’t have children yet, but play with our friends. Our favourite is Galaxy Trucker, game by Vlaada Chvatil, about building spaceships from spare parts and racing them against galaxy. All players build at the same time, so there is no waiting time. My personal favourite is Dungeon Petz. You are a head of imp family running pet shop. You actually have to take care of pets who are hungry, poo, need to play, etc. It’s a little bit difficult and needs a bit of explaining at the beggining (there are many different places on the board), but it’s also a lot of fun and pictures are very cute. I was in shock for a moment when I saw the first one on this list! I loved Enchanted Forest as a kid! My parents have it and none of my friends had ever heard of it and I’ve never noticed it anywhere (not that I was looking) so thought it was some random game they happened to buy one time. I think I even made my husband play it with me shortly after we got married, haha!! I don’t think he was impressed. Now that I know it’s not so random of a game I will have to get this for my kiddos!! Several of your favorites are also mine! And several of the others are ones I have thought of buying but hadn’t chanced it yet since I haven’t ever heard of them, just saw them on Amazon. Thanks for the run down memory lane and the great game suggestions! So excited to try some of these games, we have family game night every Sunday it’s something our kids age 3 & 6 look forward to. 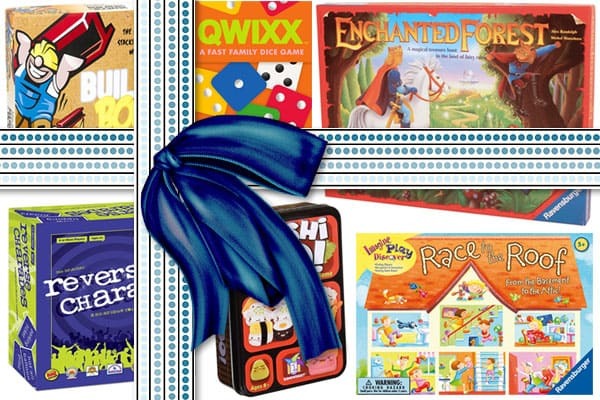 So excited to try some of these games, we have family game night every Sunday it’s some our kids age 3 & 6 look forward to. We also love Ticket to Ride, and have the U.S. and Europe editions. We actually love the Europe expansion pack, because it contains “warehouses” and “depots” that can be used with any of the TTR games, and totally change up the gameplay and strategy. If you want to shake up your TTR playing, you might check that out. Side note: I have to say that the cards and route cards that come in the expansion are fine, but the regular Europe cards are large-sized, unlike the U.S. edition. The best thing about the expansion pack is the included warehouses and depots. My new favorite game is Code Names! It would be hard to play with kids, though. Do you have any more recommendations for just two adults? I only have one child, a toddler. It would be fun to have more games that my husband and I could play together. My favorite two player games are Jaipur, Hive, Lost Cities, Ticket to Ride, Word on the Street – I’ll try to think of a few others! I know you didn’t ask me, but we are in a similar boat – my oldest is 4 – some two player games that we like: Seven Wonders Duel, Robinson Crusoe (this one is cooperative, so there are no hurt feelings at the end! ), and Dominion. For really quick games, we love FLUXX. We have a bunch of non-two player games that we try to change the rules to work for 2 player, but games actually designed for two players are so much better. Lots of people are recommending FLUXX. Can’t wait to check it out! Yes. I just came to recommend Flux to you! We play it with an age range of 5-60 lol. The 5 year old does well, just needs a little help remembering how to change cards out. Have you heard of Go? It’s (somewhat) similar to chess, my 7 year old son and I play it at least once a week. For a lighter game, I would try Battleship! Love the list! We have about half of those and I’m excited to check out the rest! Game lovers unite! Mel – I LOVE your gift guides (AND your recipes)! I’m clueless when it comes to games for our grandchildren and I can always depend on you. We’ll be adding one or more to our Christmas list. You have one of the BEST blogs on the web!!! Thank you! Mel, have you ever played Quantum? It is a super fun strategy game (for teens/tweens/adults. We love it! I think I played that a long time ago. Thanks for reminding me! Thank you so much! I always love your game gift guides and end up buying several. We have a Christmas Eve tradition that our boys get to open one present which includes matching pajamas, a special homemade snack and a game or two that we all play that night. Can’t wait to add some of these games to the line up. You’re the best! I love the idea of opening the game on Christmas Eve instead of Christmas! I might have to adopt that. We found qwixx last year for Christmas and play it regularly. I laminated the score cards and we use dry erase markers. It is for sale at Kohls again this year. Last year after Christmas I picked up a bunch of them for $5 a piece. I have laminated their score cards and given them to friends. Everyone we have shared it with Loves this game. I love your game guide and I have bought some of your ideas in the past. This year I found a game I think your boys would love it called Maze Racers and it a game where you get build mazes for marbles I know my two boys 8 and 13 love it and enjoy the challenge of making the mazes. Oooh, excited to check that out! For those of you that asked, I just added a list at the bottom of the post of our top 20 favorite games ever. I may change that as new ones come to mind (it makes me nervous to decide important things like that so quickly!) but for now, if you don’t want to sort through multiple gift guides, it should give a start on some top, top faves. I wait for this post! Thank you! Thank you! Love your site. Thank you SO much for the suggestions! I’m going to buy the Labrynth game for my 12 year old. I’m usually the only one that will play with him and it looks like I would enjoy it, too. Oooh, that would be a good one for the two of you! We love games at our house as well and many of your favorites live in our game closet too! Just a couple of game suggestions for you, from game-loving momma to another: Codenames (perfect for groups large and small, quick and easy to learn), Machi Koro (beautifully illustrated tabletop card game). Thanks for the great suggestions, I’m looking forward to trying some new ones this year! So manual! I need to pick out one for Christmas this year. The only one we have from this list is doodle dice. We got it last year for Christmas and it is fun and easy to pick up! Have you tried Sequence? It may be by the same people, but we love that one! Better for an older crowd…eight and up finds it more exciting, but probably even ten and up. Yes, we love sequence (we have the kid version, too). We love Labyrinth! I have such poor visual spatial skills, that my 8 and 10 year old always collect their treasures before I’ve barely collected one…but I’ll still play it every time they ask. I guess I’m a glutton for punishment. Thank you SO much Mel! I look forward to your gift guides every year and you’ve never let us down! The games and gift ideas we gotten from you are always a hit. This is perfect! I have three nephews who love games, and I was given a recommendation to choose new games for their gifts this year. Plus, I have four younger children whom we’re trying to get to learn some games to play together, so I really appreciate the age recommendations. Thanks! Love your gift guides! We are a big game playing family, though my oldest is 4. My husband and I love Robinson Crusoe, which is a cooperative game and would probably work for 12+. The rule book leaves a bit to be desired, but you can find lots of help deciphering online if you need it. I have been dying for this list to come out so I can start Christmas shopping!!! I seriously wait with baited breath every year for your game list. We have loved almost all the games we bought from your list. Great post, this is really helpful! Thank you so much for this post!!! our family LOVES playing games!!!! we are a huge game playing family and love them so much! our game collection also is quite embarassing!! i already put a bunch of these on wish lists for my kids and spouse. i had to recommend a few games to you that my family LOVES. One is called Dragonwood. It is really really fun and simple and has great pictures. My 8 y.o. loves it and so does everyone else we play it with. Another one is Niagara. This is such a fun one! it’s a fun board and fun playing pieces and my 8 yo can totally play that one too! And then Splendor is another one of our favorites that my 8yo can pick up and loves to play also! We have tons of other family games, but those are the ones my daughter can play with us that she loves! Would you think about doing a post on your top 10 or 20 all time favorite games ever?? Between this list and the lists from past years, which I’m too lazy to go find, the choices are overwhelming! :). I’d love your thoughts on a few games that are must haves. That’s a great idea, Jocelyn! I’m not home right now but I’ll put together a list when I get home and post it here. This is my favorite part of the year!!! Minus dessert posts. We love bohnanza. Played it for 10 years now! Thinking expansion for my 9 year old. And blink is so great. We got sleeping queens last year maybe and have been through two so we have ultimate sleeping queens now. You’re the best. Thanks and look g forward to tomorrow! I love your gift guides, Mel! We buy some of your recommendations every year. Thanks so much! Thank you! The last two years I’ve bought a game for each kid based on your list for Christmas. I’ll get to reviewing these! These gift guides are the best! We also love Ticket to Ride, Bohnanza and Loot! Enchanted Forest, Race to the Roof and Build or Boom might have to make an appearance at our house this year! Thanks, Mel! Wow I have never heard of most of these! Have you seen the perplexus epic and twist, etc? I’m probably way behind the times, but those are awesome! Just for one player, but I’m getting one for my nephews to share. Oh yes, we love the perplexus games! And here I was all excited that I finally had a game to tell you about, haha, of course you already knew about i (Qwixx 😉 love these lists! Great choices! I’ve already put one on my Amazon shopping cart and one on my wishlist. and I don’t think I’m done. I can also recommend “Cover your A$$ets”. I bought it after seeing it on your gift guide last year. Awesome game! After playing it with friends, 3 other families have bought their own. Ten thumbs up! Wonderful!! Thanks so much for all the insight and ideas! You’re the BEST!! Thanks Mel. These are great. I have an 8 year old son and a 5 year old daughter. I think a few of these may find their way under our tree. I look forward to this every year and always wind up purchasing some of your suggestions! I love your game gift guides! Thank you so much! Our game cupboard sounds like yours so I love getting recommendations from a fellow game lover. Haha, thanks Kattie! I agree that shopping for four boys can be tough…I hope some of the recommendations this year will help! I LOVE your gift guides and look forward to them!! Thank you!! You made my day, Mel! I’m not doing toys anymore This lists is full of awesome ideas. Thank you! !